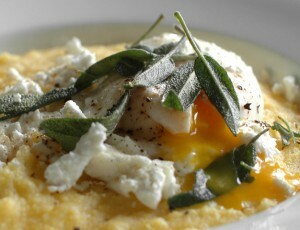 For breakfast, brunch or a light meal polenta with soft poached egg (or eggs!) is a light alternative to toast, especially when fresh sweet corn is added into the equation. Creamy and comforting below, the frizzled sage leaves give everything a crispy, colourful lift. Poach the eggs to your liking: the instructions below will give a runny yolk, but all means leave the eggs longer if you like them well done. Just be sure they are very fresh! 1. For the polenta, remove jackets and silk from corn and shear the kernels off (to do this, shear kernels from one surface then use the bare face to steady the cob as you remove the rest of the kernels). Place kernels in a large saucepan with 750 ml of water and salt. Bring to the boil and simmer 15 minutes. Cool a little then blend in a food processor on medium-high speed for 2 minutes. Return to the pan with 1.25 L water and bring to a gentle simmer. Add the polenta in a stream, stirring with a wooden spoon, and cook for 5 minutes, stirring constantly so that the polenta doesn’t stick. 2. Meanwhile, to poach eggs, fill a medium sized saucepan 5 cm deep with water. Bring to the boil, remove from heat and use a spoon to create a very gentle whirlpool (this will encourage eggs to keep their shape). Working quickly, crack each egg and carefully slide into the water. Cover and sit for 4 minutes before removing with a slotted spoon. 3. For the sage leaves, heat olive oil in a small saucepan over medium heat. Add sage leaves and cook, stirring, for about a minute or until they are dark green and fragrant. 4. 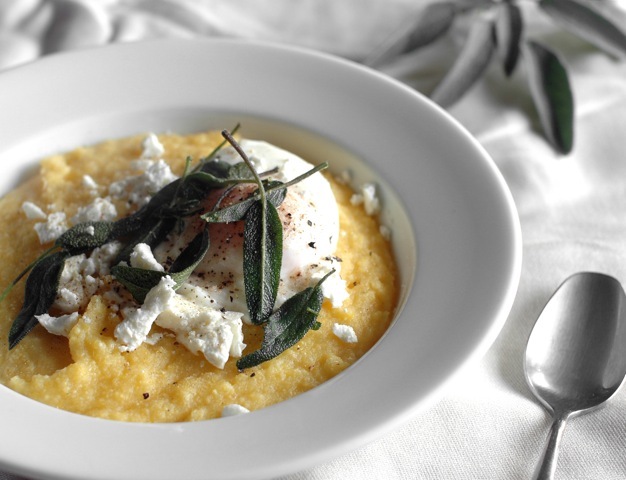 To serve, divide polenta among warm bowls. Crumble chevré over then place an egg atop each serving. Season generously and scatter with the frizzled sage leaves.